When it comes to food we (in the U.S.) typically measure energy content in terms of Calories (also known as kilocalories). One Calorie of energy is equivalent to the heat required to raise 1 kilogram of water by 1 degree celsius. Think on that the next time you eat a 300 Calorie snack bar. A typical person will consume about 2,000 Calories per day. If we assume they don’t gain or lose weight, that means they must also give off about 2,000 Calories of heat per day. (After all, energy is conserved). Suppose we then ask how much heat a person produces per volume? Let’s assume an average person has a mass of 75 kg (equivalent to about 165 pounds). Humans are mostly water (and have roughly the same density as water). The density of water is about 1 gram per cubic centimeter, so the volume of a typical person is about 75,000 cubic centimeters. This means a typical person generates about 0.03 Calories per cubic centimeter each day. So now let’s compare this to the Sun. 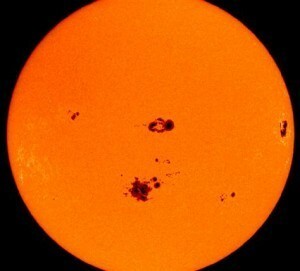 The Sun radiates about 8,000 trillion trillion Calories per day. That’s a lot of energy, but its volume is 1,400 million trillion trillion cubic centimeters. That means on average the sun generates about 6 millionths of a Calorie per cubic centimeter each day. 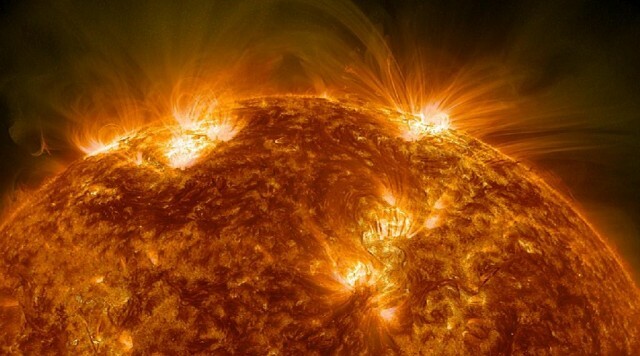 In other words, you produce about 50,000 times more heat per volume than the Sun! This trick doesn’t work if you calculate energy radiated per surface area. On that count the Sun has you beat by a factor of more than 100,000. Excellent post Profesor.To much understanding.